The intercom facility is a great boon to any industry that has a lot of interpersonal communication demands. 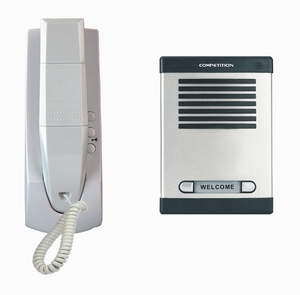 It is very unlikely that your business may not require a dedicated intercom set up, no matter how small your company is. CompuGeeks has best-in-class solutions for all types of customer demands; we work on many options that can be customized to make a solution appropriate for your business. The primary advantage of having intercom as an approved system of internal communication is saving on the cost of communication. One telephone line can be channelized into many extensions and they can be integrated with other communication platforms like the Internet or Ethernet connections. The second and the most significant aspect of having a dedicated set up for internal communications would be about enhanced security. Secured and encrypted communications are very crucial to any business operating under the cloud of competition. Our role would be more proactive in analyzing the core communication requirements, share the prevailing systems and processes and further recommending a customized solution that is exclusive for your business. Not to exaggerate, but all our services are precisely aligned with your business priorities and therefore we look forward for your briefing in terms of objectives and preferences. Today, the intercom scenario is more advanced with internet protocol based calling and connectivity services. Popularly known as VoIP Communication Systems, they are secured and sophisticated communication devises. Our technical experts confirm the validity of these networked intercom systems that are ideal for any kind of business. Intercom facilities and services need not be static all the time, there are portable devices and systems that are used in various businesses that would require on-the-go working with better performance. A lot of it depends on the intercom facility as it is also effective in cost optimization. The wireless intercoms are now becoming more popular as they would suit the specific business requirements; they are of course elegant and effective at the same time. Working on any intercom setup, we take a very critical view about the utility requirements in comparison with the initial requirements shared by the clients. We explore all the possibilities to optimize the material usage and bring in the equipment that has optimized value for spending. All our equipments are tested and certified for quality standards and they are handled by networking and IT infrastructure experts in the industry. We are also committed to offer continuous maintenance support so that your business activities remain uninterrupted. D.I.Y kit does not include cable. General Terms & Conditions apply to all offers listed above. * All prices are subject to site inspection.